Prime Minister Hun Sen has vowed to rule the country for 10 more years in light of the “treachery” of opposition leader Kem Sokha. 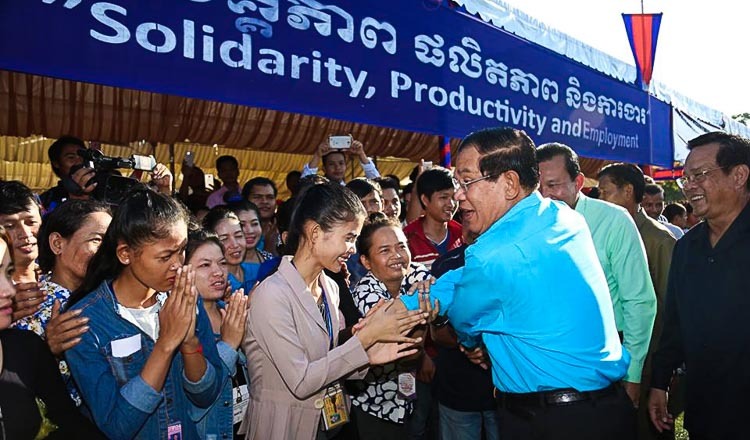 Addressing thousands of workers at Canadia Industrial Park yesterday, Mr Hun Sen said he made the decision to stay on for another two mandates after finding out about Mr Sokha’s alleged plan to topple the government with the help of the US. The Prime Minister urged workers and their families to vote for him in next year’s election, boasting of how he was the world’s longest serving premier. 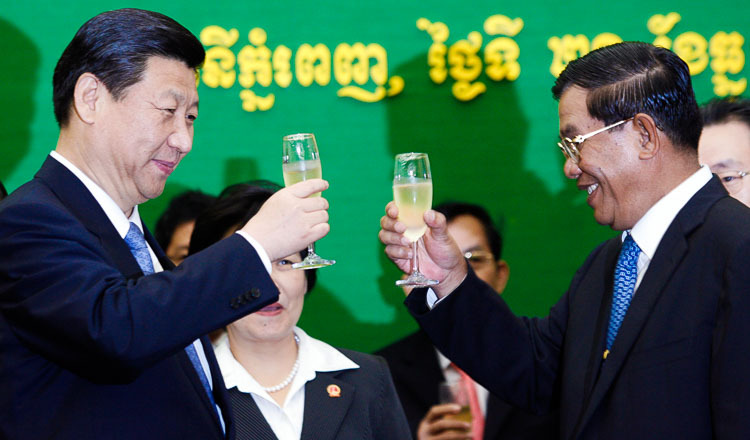 Mr Hun Sen, who is 65, would step down in 2028 if he won the next two elections and then agreed to retire. “Before I was hesitant about when to leave office, but after seeing the painful and treasonous acts in recent days, I decided to continue my work for another 10 years,” he said. “I hope all of you will vote to support me,” he added, saying he would ensure the development of the nation and prevent anyone from destroying the security of Cambodian people. Mr Sokha was on Tuesday charged by Phnom Penh Municipal Court with treason for conspiring with a foreign power. A government statement said the case against Mr Sokha was based on video footage published by the Australia-based news outlet CBN and other evidence collected by police. The National Assembly will today hold a permanent committee meeting to discuss the charges against Mr Sokha in relation to whether or not his parliamentary immunity should stand. CNRP members of parliament yesterday released a statement calling on prosecutors to drop charges against their leader. They said the CNRP could not accept the charges against Mr Sokha, claiming his arrest was illegal, and the case could not be considered a “flagrant crime” because the video footage of the speech in Melbourne had been in the public domain since 2013. Five CNRP lawmakers including party vice president Mu Sochua have asked the court for permission to visit Mr Sokha in prison on Monday. Interior Ministry spokesman Khieu Sopheak said the court is now in possession of all the necessary evidence to investigate the charges against Mr Sokha. He added the ministry would arrest or bring people in for questioning if it found they were connected with the case. Mr Sokha’s arrest and detention was widely condemned by the international community, including the EU, the UN High Commissioner for Human Rights, America and Australia, while China offered its support to the government on the issue. Foreign Affairs Minister Prak Sokhonn met foreign envoys on Sunday to explain Mr Sokha’s arrest. He told the diplomats that Mr Sokha was arrested by judiciary police in the presence of a prosecutor. 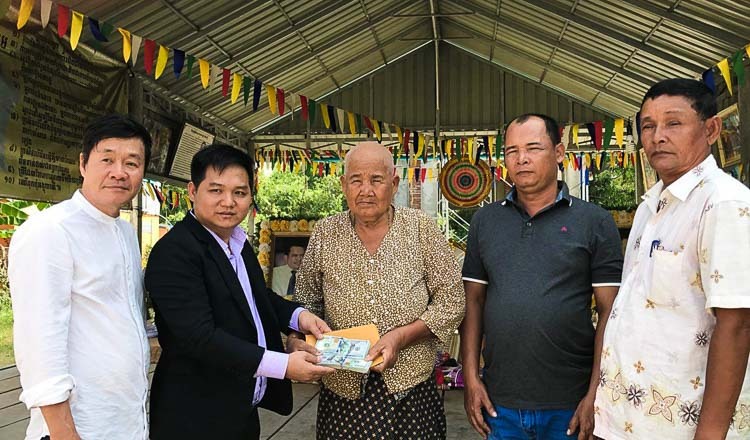 He also presented them with the CBN video footage in which Mr Sokha is accused of speaking about a plan to overthrow the government. “The strategy to gain power is common to every political party and does not constitute an offence,” Mr Sokhonn said. Mr Sokhonn added that a longer version of the video puts more weight on Mr Sokha’s guilt. “For us, for me, this is a clear act of treason, but let the court decide,” he said. In his speech to workers, Mr Hun Sen called on foreign countries to clearly examine Mr Sokha’s words in the video footage. “Would your country accept these words if you were me?” he said. The footage appears to show Mr Sokha saying the US government had been helping him to push for regime change in Cambodia since 1993. In the footage, Mr Sokha is heard saying millions of people support the CNRP’s strategy for change in the country. “The United States has helped me. They instructed me to follow similar models as those in Yugoslavia and Serbia, which successfully changed the dictatorial leaders there,” Mr Sokha said. Mr Sokha’s daughter, Kem Monovithya, who is deputy director-general of public affairs for the CNRP, said the party would not be appointing a new leader while her father was in prison. However government spokesman Phay Siphan told Reuters on Tuesday that the CNRP could be shut down if it fails to replace Mr Sokha with a new president.